Picking up where we left off: Sean and I spouted a crop of young seedlings on our windowsill and were about to transfer them to our rooftop, as part of our urban gardening experiment. 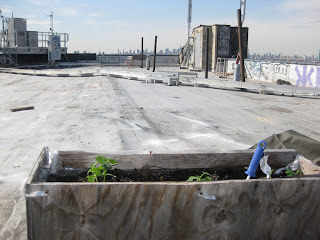 In late April we figured that the chance of frost had passed, and that our little plantolescents were ready to make the transition and adjust to the conditions on the roof. 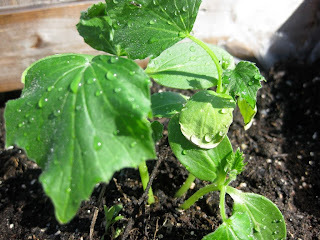 I had read that it's necessary to harden off your seedlings, gradually exposing them to more sunshine, wind, and elements before actually putting them in the ground. Unfortunately, my sources recommended an unrealistic schedule for a working stiff. I envisioned the call to my boss: "Sorry I can't come into work until 1:30 today, my plants need exactly four hours of direct sunlight..." So I made some limited attempts, dutifully carrying them up and down on weekend mornings, hoping that they'd get the message and toughen up. Finally, at the end of April, we planted lettuce, cucumbers, and squash in a variety of bins and buckets on the roof-- the tomatoes, beets, and herbs were still too delicate to leave the nest, but would join the party soon. Our plants looked awfully small up there. The week after we moved the plants up was a miserable one-- the temperature dropped, and it poured rain nearly every day. At least I didn't have to remember to water the plants upstairs-- our little seedlings were getting drowned through and through. Kids always drink too much the first week of college. By the end of the week, the plants we had raised up from tiny seeds were mush, nothing but some withered, rotted stems. Picture me on my knees in the pouring rain shouting my null protestations to the heavens, as a heart-rending montage of their short (but highly eventful) lives flashed by. The first attempt at roof garden was a fail. Anyway, tune in next week. Why? Cause hope springs eternal.